Take Current Affairs quiz January 31, 2019 to enhance your General Awareness. Practice with our esteemed Current Affairs quiz January 31, 2019 questions which covers all important events across India as well as World. Make use of all important Current Affairs quiz January 31, 2019 questions with answers updated here, at free of cost to succeed in all competitive Exams and Interviews. Who is been reappinted as the Chief of AAP Punjab unit? Sangrur MP Bhagwant Mann was reappointed chief of the Aam Aadmi Party’s Punjab unit. Israel Aerospace Industries (IAI) has enetered into agrement with ______ and ______ for providing Naval Medium Range Surface-to-Air Missile (MRSAM) systems worth $93 million? Israel Aerospace Industries (IAI) announced entering into agreements worth $93 million for providing Naval Medium Range Surface-to-Air Missile (MRSAM) systems to India. The contracts for the air defence system were entered with the Indian Navy and the Cochin Shipyard. Which Country topped the Global Corruption Index? Denmark topped the Global Corruption Index 2019. Ms.Chanda Kochhar who associated with the scam of lending loan is associated with ________ bank. The ICICI Bank has decided to terminate the contract of former MD and CEO, Chanda Kochhar. Ms. Kochhar, who assumed charge as MD and CEO on May 1, 2009, resigned in October last year. The bank also said there would be a clawback of bonuses paid between 2009 and 2019.
Who is the Minister responsible for the Ministry of Textiles? The Minister responsible for the Ministry of Textiles is Smriti Zubin Irani. Which of the following Ministry launched the Artisan Speak? How much does the JSW Energy plan to invest in the Electric Vehicle project? JSW Energy is planning to invest as much as Rs.6,500 crore in the manufacture of electric passenger cars. Ministry of Textiles and Government of India launched Artisan Speak at Elephanta Caves (UNESCO heritage site). When is the World Leprosy Day celebrated? World Leprosy Eradication Day is celebrated on 30th January of every year. Which state CM inaugurates States first Astro Turf Football Pitch? Nagaland state CM inaugurates States first Astro Turf Football Pitch. Indian Council of Agricultural Research (ICAR) Launches National Agricultural Higher Education Project (NAHEP) . Which state Government approves construction of Ganga expressway to connect Prayagraj with western Uttar Pradesh? Uttar Pradesh Government approves construction of Ganga expressway to connect Prayagraj with western Uttar Pradesh. Are you looking for right place to enhance your Knowledge on Current Affairs of 31st January 2019 through effective Quiz section? 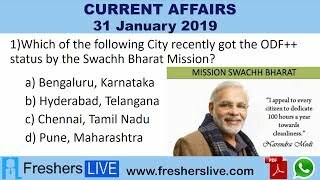 FreshersLive grants you the advantageous Current Affairs Quiz questions with accurate answers for 31st January 2019 which covers all the important events, supreme Awards, major occurrences in the National as well as World level. All important Current Affairs Quiz questions of 31st January 2019 are updated instantly in this page. Everyday at least 25+ Current Affairs Quiz Questions are displayed in this FreshersLive page. Correct Answer for each quiz question is given at the end of the entire 31st January 2019 Current Affairs Quiz questions section. You can estimate and upgrade your GK by attending these useful quiz questions. Entire quiz questions of 31st January 2019 Current Affairs covers Competitive Exam as well as Interview point of essentially important topics like International News, National News (ie. Indian Affairs), Science & Technology News, Environmental News, Bills & Acts Passed by Government, Defence News, About important Persons, Places, Banking & Economical News, Awards & Honours, Sports News, Revolutionary Updates on Arts & Culture, Obituary, Summits & Conference, Important Committee, Schemes, Appointments, Important Days & its Theme for Current as well as upcoming Year, Books & Its Authors, Agreements & MoUs, Budget, Taxes, Various Important Lists & Indexes, Visits by World Presidents, Prime Ministers, Political affairs and all Current Events. 31st January 2019 Current Affairs Quiz Questions updated in this page are prepared in the sense to help all aspirants to succeed in various Competitive Exams like UPSC IAS and other Civil Services Examination, Various Bank exams like IBPS PO, IBPS Clerk, SBI PO, SBI Clerk, RRB PO, RRB Assistant, Insurance exams like LIC AAO, UIIC Assistant, Railway Exams, Various Central Government Exams like SSC CGL, SSC CHSL, and more. Attempt all the Current Affairs Quiz Questions of 31st January 2019 and evaluate your score by matching your response with the correct answers mentioned at the end of this quiz questions section. By practising the FreshersLive Current Affairs Quiz Questions on a daily basis, you can surely succeed in the competitive exams as well as the interviews easily. Make use of this ultimate resource to the fullest and quickly achieve your goal!